Construction contractors are skilled at figuring how to do just about anything on the job site. Having worked in the construction industry for many years prior to joining Safe-T-Cover®, I was always impressed with the ingenuity and capabilities of the various trades. So when it comes to assembling a Safe-T-Cover® insulated enclosure we could probably just ship the panels and the contractor could figure it out. However, we know how important speed is in today’s fast paced construction industry. You need to assemble the box correctly and efficiently. Here are a few things you may be wondering about. You’ll need a drill capable of installing the anchor bolts in the concrete pad. Once that is completed, a screw gun, hammer, and crescent wrench will ensure you’re ready to go. Four tools! We even provide the concrete bit with the hardware to save you some time. Shown here is the actual hardware kit we include with every purchase. 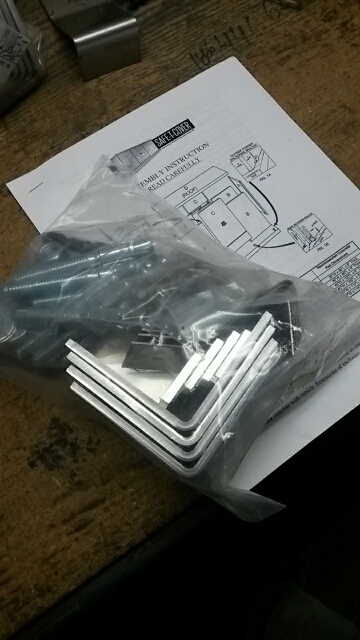 We’ve packaged the parts together in zip lock bags to help you stay organized while putting the enclosure together. The individual bags then get sealed up in one bag so everything is together. All the hardware you need to install the cover is in this bag. Each box comes with a set of written instructions. Instructions for each of our enclosures are also available online. You can even download them from your phone while on the site. Follow them closely and you’ll find the box comes together smoothly, the first time. This saves you time and stress. Recently, a few contractors have requested we provide these instructions in Spanish as well. We're actively working on the translation and will soon be including instructions in both English and Spanish. To find out for ourselves, we filmed two of our employees putting one together. In less than 4 minutes, two men remove the cover from the box and put the panels in place. None of the mounting anchors or screws were installed during this video - we did not want to mount an enclosure to our parking lot! You can probably expect to send an hour or less to complete all the steps. Safe-T-Cover® knows how important your time is on the job site. We’ve designed an enclosure with you in mind. We want our cover to be fast and easy to install. If you have any trouble with the installation, call us at 1-800-245-6333 and we’ll help you figure it out. Likewise, if you have suggestions on how to make the installation easier or faster for you, please let us know. Send us your input to info@safe-t-cover.com and include pictures if you think that would help.